Once again, we bring to you another amazing wedding venue in Malad! Located just off Link Road, Grand Hometel, Malad, Mumbai, is a favourite venue for weddings and corporate events. The hotel enjoys a strategic location and has both the national as well as the International airports in close vicinity. The lobby-level carpeted banquet hall is endowed with natural light flooding in through the large windows. Looking for something more small-scale? The comfortable meeting room at Grand Hometel has stately wood paneling and can add grace to any private or corporate event. If you've got a private event planned, the open-air rooftop banquet area Panorama has a beautiful view of the neighbourhood. The added glamour of the pool makes it perfect for a Sangeet! 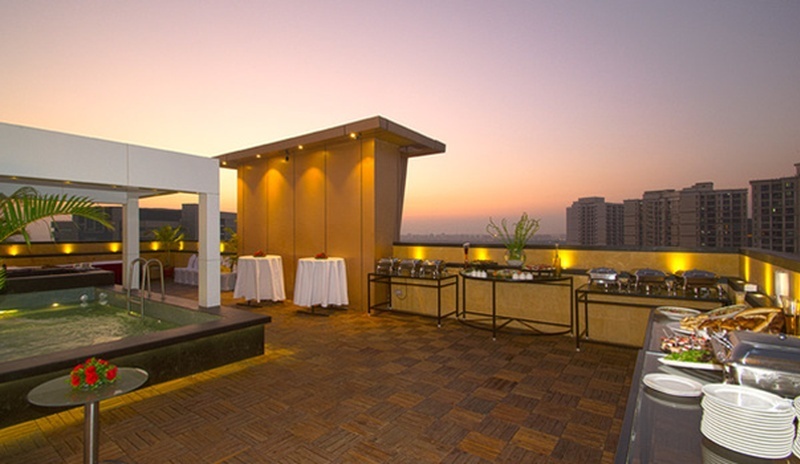 The Grand Hometel in Malad West, Mumbai is well-equipped with its wedding hotels, cocktail venues, banquet halls and terrace banquet halls. Magnolia Hall: 200 guests in seating and 350 guests in floating. Panorama Terrace: 200 guests in seating and 300 guests in floating. Stardust Hall: 50 guests in seating and 75 guests in floating. Vegetarian and Non Vegetarian food is served at this banquet hall in Malad. Packages starts at Rs 1,000 per plate for vegetarian menu and at Rs 1,150 for non-veg menu.